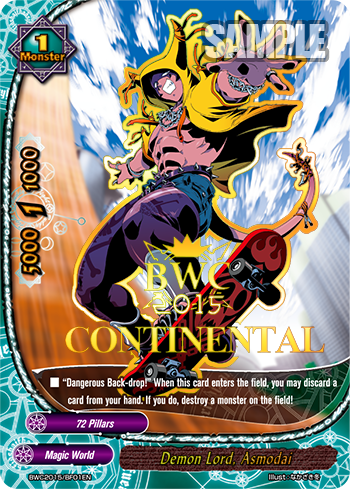 With the last round of Continental Championship concluding yesterday, the Bushiroad World Championship 2015 has reached its last leg! This year we had our Continental Championships on three consecutive weekends starting with the North America Continentals in Los Angeles, California on November 21-22, followed by the Europe Continentals in Düsseldorf, and the Asia-Oceania Continentals yesterday! 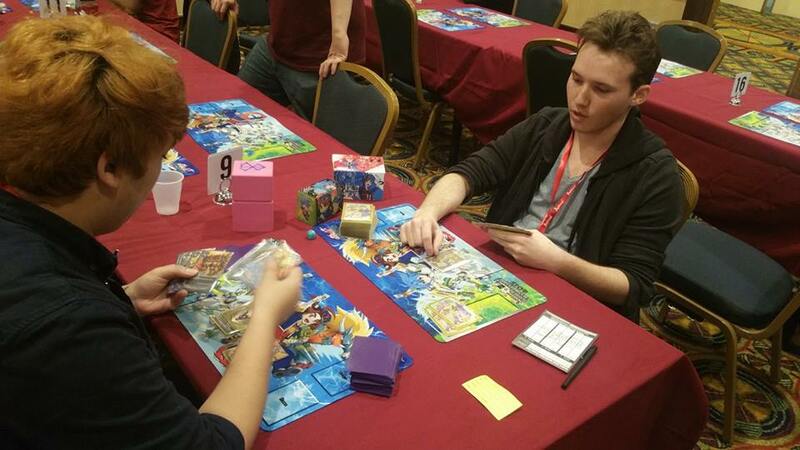 Reporting live from the venues, our staff are bringing you the event reviews here on Buddyfight Buzz! 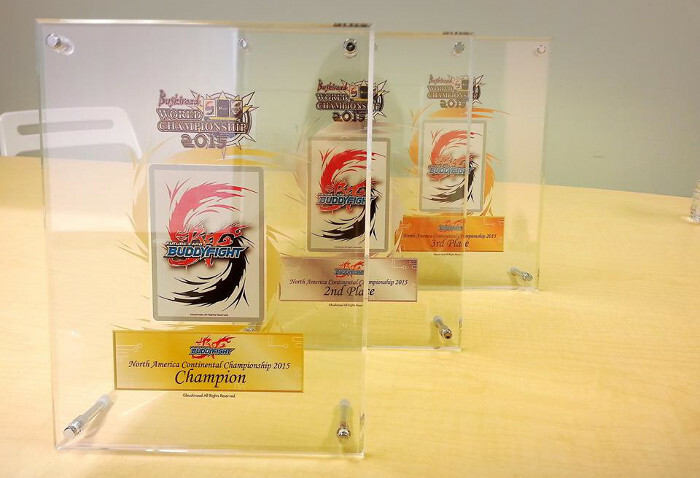 But first, let’s take a good look at these very special trophies prepared for the Continental champions! Designed in Japan especially for card gamers, one can insert a card into the trophy via a panel on the trophy’s reverse side. Winners can feature the card that has brought them victory here! Special commemorative cards were also given to all invitees! Everyone is familiar with the popular Asmodai, I’m sure, and this is in fact the original “Demon Lord, Asmodai” from Booster Pack Vol. 1: Dragon Chief complete with its original ability, “Dangerous Backdrop!”! This ability allows the player to destroy a monster on the field at the cost of 1 card from the hand!! This is, of course, a hot-stamped version that is only handed out to players who attended the continentals – a symbol of the player’s skill and a collector’s item all at once! 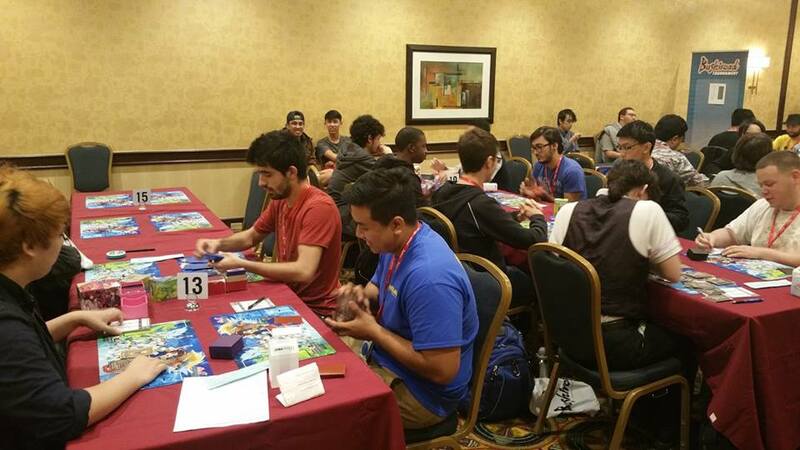 In the first of the Continental Championships report series, we are taking a look at the goings-on at the North America Continentals! Intense fights amongst regional winners going on! The North America Continentals was a invite-only event only with numerous spectators coming to watch the games and support their friends. Almost half of the players were fielding Ancient World decks and one of them emerged as the winner! 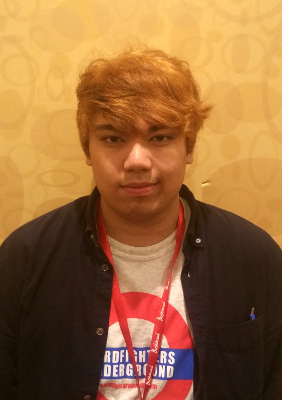 Kevin Cho is no stranger to Bushiroad TCG tournaments, and has made Chicago proud again this year with his performance! He made it all the way to the Japan Finals last year in the Cardfight!! 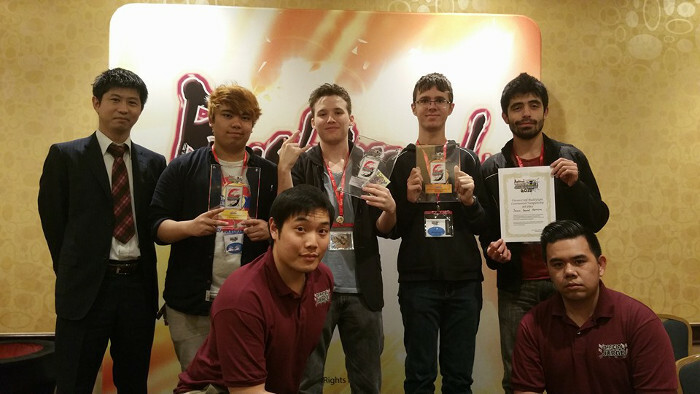 Vanguard tournament, and has come back this year for Future Card Buddyfight. Q: Congratulation! How does it feel to be crowned Continentals Champion? A: I’m really happy and really proud of myself! It was a real accomplishment and I just feel astounded. Q: Are you excited to go to Japan? A: Yes! I really love Japanese culture. I have actually been there before, but I’m very excited to visit again. Q: Besides the finals, what do you wish to do there? A: I want to go shopping and buy a lot of hobby stuffs! Also hang out with the competitors from other countries. Q: Is this your first time participating in Bushiroad World Championship? A: First time participating for Buddyfight, though I did participate for Vanguard before. I have been playing both games for 2 years now, but I did not start getting serious with Buddyfight until about a year ago. Q: Can we know your winning strategy? A: My deck is a deck of attrition, which means I outlast their resources, so it’s pretty versatile and I adapt to their play style and go for game. For today, I used an Ancient World deck. Q: Do you have a favorite card? A: “Emergency Launch Decker Drum”; he helped me win regionals. Until “Barbed Wire” came out he was my answer to everything, but he’s not as effective anymore. Q: Anything else you wish to say about the event/the game? A: The event was held pretty well, it was small but really felt like Bushiroad focused on us players. The game is at a really good place right now, most things feel pretty balanced. Lastly, I’d like to say thanks to my friends; I wouldn’t be able to get here if I didn’t practice with them. I actually learn more from losing to them more than anything! Thank you Kevin for sharing, and see you in Japan! That’s it for today’s article! Stay tuned to next week’s Buddyfight Buzz for reports and champion interviews from other Continentals! Buddyfight Buzz is a weekly column containing all things essential for Buddyfighters: card insights, latest buzz, any many more! 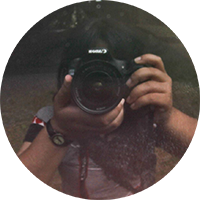 We publish new articles every Monday! We are keen to hear your thoughts. Drop us a comment on Facebook or e-mail us at sg_support@bushiroad-gp.com!